I have an 8″ wide by 8′ sheet of 3/4″ plywood which unexpectedly got designated as a ‘holder of stuff’… Glue, contact cement, foam brushes, and various tools that never quite seem to make it back into the toolbox, but yet rarely used. It first started out on the benchwork that initially became Bryn, and when Bryn’s track was laid, we moved that sheet down. And then we moved it up when we laid track to Union Bay. 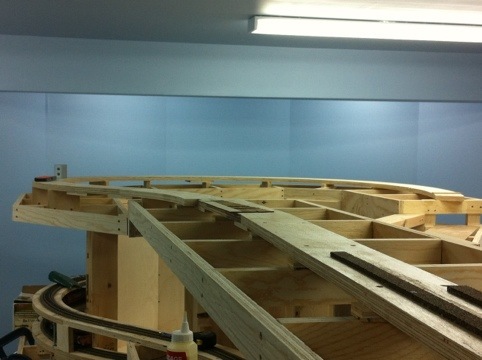 Well, this weekend we needed to move the shelf once again…This time to where we can keep it until scenery starts! 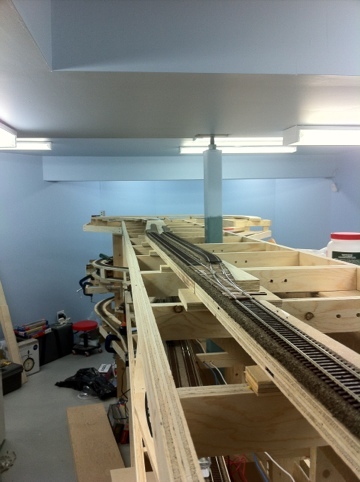 Cam came over on Saturday and Sunday and we finished off the trackwork out of the helix (yay! All helicies are done for trackwork!) and laid track to Arrowsmith siding. I hastily built a couple turnouts for the siding and then we got to benchwork. And did we ever go far! Wrapped all the way around the end of the peninsula, and down the hill towards Port Alberni. Of particular interest is the fact it’s all supposed to be on a 1.7% grade from just past Arrowsmith all the way down to Port Alberni. I fully expect the port freight to really work but it’s going to be able to do the job without doubling the hill on account of the helix being a much heavier (and curvier) grade than the run up to the summit. You’ll note I said “supposed to be”… Well, with what tools we possess, a digital angle indicator from Micromark, a really good vernier caliper and several levels and a pair of programs called “RiserCalc” and “GradeCalc”, we tried as best we can to make sure the risers are all at the correct height, cross-level and we still didn’t quite nail it. Some spots are a little steeper, and some less so. In the end, the digital level was discarded and the math made the grade. Looks pretty good. When it came time to plan for how we’re going to incorporate Rogers Creek siding, we found a few things that didn’t quite work. Specifically, how to get a wider track spacing on the pieces of 4″ wide curved plywood… It would’ve required a sharper mainline radius, or purchasing another sheet of plywood and making poor use of it. In the end, we’re going to delete the siding from the plan on that plus the fact it would all be on a grade. Much as I’d like to have working handbrakes on my rolling stock, I just don’t see it in the cards, and I’m not one for sticking a pin up into the axles of cars to keep them on the grade in the siding. At some point I’m going to need to get some dough and get going on the shelf standards and shelf brackets… I’m running out of benchwork I can build on! This entry was posted on February 21, 2012. It was filed under Benchwork, Trackwork. 1. I told you so. Someone told me though, so hey ho, you have now built a massive flat surface in your house which accumulates junk faster than you though humanly possible ! 2. Rather than hand brakes on cars, what about mounting a torti horizontally, driving a pin up and down to act as the brake? It means cars will always end up @ the same point, but that the siding would be useable. Another idea craftily stole from elsewhere (I think Country Gate). I’m back in Hfx, so no layout work for me right now. But, I have Long Marton back to being double ended, now I need to do some programming. I read your comment about the need to use pins to hold rolling stock on your grades and would like to add you don’t have to do that. I have two operating “brakes” I constructed on grades on my layout and they work well.